Welcome to the Redwood Hostel, Kailen Reil! 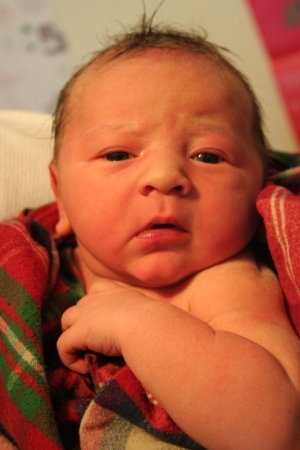 We welcome with love the birth of Kailen Reil on September 26. He was born at our home, a.k.a. the Redwood Hostel, upstairs in the staff kitchen. It was late afternoon when active labor really took hold and, being a warm day, the window facing the hostel’s entrance was open. Arriving hostellers were greeted with inexplicable screaming–but all was soon explained by my dad and our eldest son Rory, who passed the laboring time in the Common Room putting together puzzles and telling everyone that mommy was having a baby. Kailen, Rory and Ryan & I stayed upstairs within the warm cozy of our staff apartment for a few days, happily sequestered, and I didn’t get the chance to introduce him to the hostellers who’d been partially privy to one of the most intimate, dearest moments of our life. Thank you, Redwood Hostellers of Saturday September 26th! We felt your warmth from below. 2 1/2 years ago, we posted our Frequently Asked Questions here on the blog. Well, it’s time for an update. Much has changed. Plus, few people are probably scrolling through the 50+ postings (at 5 per page) to get to our FAQ of August 2006. So let’s update. We welcome many first-time hostellers and so aren’t surprised when this question pops up. Perhaps you’ve made a reservation because this is the cheapest lodging in the region, but you aren’t quite sure what to expect. Where do I sleep, you may ask. Where do I eat? Do I get to shower in private, or will I be sharing my shampoo with a family from France? Never fear, for the answers are here. Yet this first answer is the most difficult to define, because a hostel is many things. It’s inexpensive lodging with a complete self-service kitchen, saving you the expense of eating out. It’s a place to learn about the local area and meet travellers from all over the world (in any given month, we welcome people from Ireland, Japan, South Korea, New Zealand, Canada, Germany, Denmark, Australia, Poland, South Africa, Scotland, the United States and everywhere in between). A hostel has usually had many incarnations. Redwood Hostel used to be the home of the DeMartin family, who raised sheep and goats on this land more than one hundred years ago. Other hostels used to be mansions, lighthouses, military outposts, farmhouses and even castles. They can accommodate 6 people (often in someone’s home) or 600 (often in large buildings in big cities) or anywhere in between. Fun fact: We are members of the largest organization of hostels, Hostelling International. To be precise, we belong to the Golden Gate Council of Hostelling International-USA. There are roughly 75 HI hostels in the United States and over 4,000 worldwide. Can you tell me more about your hostel? We’re a smaller hostel, with space for 28 people, so staying here is kind of like staying at someone’s house. It is one building with a living room, kitchen and dining room, bathrooms, and 5 bedrooms. The living room has comfy couches, a fireplace, books and games and instruments. The kitchen has all the pots, pans, and plates you’ll need, as well as stoves, fridges, toaster, microwave, coffee maker—even spices. If you bring the food, you can cook all you like. We’re found in Redwood National Park, just across the street from the Pacific Ocean, so our two outside decks look out on the water (and 4 of our 5 rooms have an ocean view). What is the #1 hostel in the world? Okay, we admit this isn’t asked frequently, but we thought we’d brag anyway. Last year, hihostels.com named us #1 in the world for customer satisfaction among HI hostels. Okay—we actually tied with a hostel in Osaka, Japan. But there are over 4000 hostels in the Hostelling International network, so we’re pretty proud of our standing (proud enough, in fact, to make up a frequently asked question about it). Anytime between 4pm and 10pm. When must I check out? By 11 a.m. on your final day. Does the hostel close during the day? Not anymore! Beginning June 1, 2007, registered guests have 24-hour access to the hostel. Though please note: this doesn’t mean you can be here for 24 hours (we’ve had to clarify for people who check in at 6pm and are only staying one night—you still have to leave by 11am). If you’re with a group of 10 or more people, then you can rent the hostel for day-use at the rate of $100 for a full day (11 a.m.-4 p.m.) or $60 for a half day (1:30 p.m.-4 p.m.). Keep in mind, however, the hostel will also be open to registered guests during that time. Another way to arrive early is by bicycle or bus. We understand that folks traveling by bike or on public transportation have less control over the time they arrive at the hostel. Please call to make arrangements for an early bike/bus check-in. Yes, plenty of free parking. Best is to pick up the phone and call 707-482-8265 during our office hours of 8-11am or 4-10pm Pacific. That way we can answer any questions you may have, and make sure you get what you need. You can also book online 24 hours a day here. Please note, however, that only dorm beds can be booked online. If you require a private room, we ask you to give us a call. While we do take your credit card at the time you reserve, we don’t charge you until you show up. At that point, you can pay with cash, traveler’s checks, or credit card. If you pay with credit card, we ask you to hand it over for us to swipe; that is we do not “just put it on the card” that we have on file (for one thing, it takes longer to enter the 20+ numbers than to simply swipe, but it also insures both that you are the card owner and that we don’t make a mistake in entering all those numbers). In a shared or private room. We have three shared rooms: Wiyot and Chilula (6 beds each) or Yurok (10 beds). There are two private rooms: Karuk has one queen bed, while Tolowa comes with a queen bed on the bottom and a single bunk bed on top, ideal for families with young children or up to three adults. We can also convert a shared room into a private room for your group, if you pay a small surcharge, depending on the season and availability. On our office door, we offer the “Middle-of-the-Night Emergency Earplug Supply.” Just come on down and grab a pair. But please note: if you sound like an airplane landing when you sleep, hostels might not be the best option for you. We’d be happy to recommend a nearby motel for you. In our kitchen. It features 2 new stoves and ovens, a microwave, 2 toasters, pots, pans, utensils, cutting boards, plates, bowls, cups, glasses, can openers, graters, peelers, Tupperware, kitchen towels, cutting knives, etc. Not to mention ample spices, cooking oil, salt, pepper, and often an orange or tub of butter left behind by another traveller. In short, our kitchen has everything but the groceries. Stock up in Crescent City if you’re coming from the north (Safeway, Harvest Natural Foods, Ray’s Supermarket, Shop Smart, or Grocery Outlet) or in Klamath if you’re coming from the south (Woodland Villa, 2.5 miles south of the hostel). Also, Arcata and Eureka (1-1.5 hours south of the hostel) have several great co-op and/or natural food markets. But what if I’m hungry and don’t feel like driving? Glad you asked. While we support local businesses and are glad to see hostellers buying jugs of milk at the Woodland Villa, we also have some goodies available at Snack-quoia Sempervirens, the little store found in our office (generally soups, pasta, drinks, instant oatmeal, chocolate bars). And let’s not forget the restaurants. Here in Klamath, there are a half dozen or so—though some of these are seasonal—while Crescent City has a wide selection of options. We keep a binder handy with just about all of the local restaurant menus, so you can peruse items and prices before heading out. The options include seafood, burgers, pizza, Chinese, Italian, Thai/Vietnamese, American, and more. Is there a bathroom in my room? None of our rooms have private bathrooms; however, the bathrooms and showers are just a few steps down the hallway. Do I get to shower in private, or will I be sharing my shampoo with a family from France? You get to shower in private. We have three showers, each with a lock for privacy. Do you have Internet, cell phone reception, and TV? No, no and no. Because the hostel is situated in a remote area on the North Coast, there isn’t access to reliable Internet, cell phone signals and cable TV. We do bring out a DVD/VCR player to show a documentary on Friday nights (generally travel- or environment-related), but other times, we keep it hidden so people can chat, play games, or read peacefully. We do, however, have a payphone. If you have your own laptop, there are several places up in Crescent City (12-13 miles north) that have free Wi-Fi, including coffee shops (The Coffee Corner, Alissa’s), a deli (Chomperz), and a breakfast/lunch restaurant (Good Harvest Cafe). If you don’t have your own computer, the Coffee Corner and the county library are your two choices for finding a computer or kiosk. Closer to us, the Woodland Villa (2.5 miles south) and the Pem-Mey gas station (7 miles south) have Wi-Fi. Maybe you aren’t asking this question, but you’re probably thinking it. Yes, the hostel is immaculate! During our most recent inspection by Hostelling International, in March 2009, we scored 103% overall. That makes us one of the highest-scoring hostels in the country (if not the highest). And as part of the hostelling experience, we gladly say “yes” whenever a hosteller asks if they can help out with a chore. Can I do laundry at the hostel? Sure. We have a washer and dryer, and sell laundry soap at the office. Please limit laundering to the evening hours of 4-10 p.m. (so last load should be started by 8:30pm). The machines are located near a sleeping room, and we don’t want anyone to have to fall asleep to the sounds of your jeans going through the spin cycle. We recycle plastic, glass, tin cans, aluminum cans, paper, cardboard, and batteries. The bins are located under the dining room side of the countertop and under the sinks. Please thoroughly rinse and flatten these items or they will mold, smell and attract bears when placed outside for pick-up. Should I be afraid of the bears? Black bears do live in this region, but they are much more afraid of you than you are of them. Before embarking on a hike from the hostel, read the posted notices that offer tips for avoiding bears and mountain lions (and what to do in the event of an encounter). You can also print bear tips from the Internet. Two years ago, one particularly pesky bear raided the hostel’s Dumpster a few times. He managed to perform a few belly flops on the lid, causing a complete cave-in. The kindly folks from the National Park Service ordered us a brand new, bear-proof Dumpster, and the bear retreated to the woods. If more ursine neighbors should happen to visit the hostel, we will make sure everyone is well aware and take precautions. How do you heat the hostel? We have a pellet wood stove in the common room that keeps the hostel toasty. For additional heat, each sleeping room has an electric heater which is quiet, efficient and safe. Do I have to be young to stay at a hostel? No. The first official hostel, back in 1909, was begun by German schoolteachers looking for an inexpensive place for the kids to stay on backcountry trips. Hostels were geared towards young travellers in the early decades, but today we welcome everyone and there is no age limit. When you say everyone, does that include families? I have a young child. This is a common concern for parents. The hostel is ideal for families–it’s clean, quiet and safe. Just ask us. Our 21-month-old son (make that 48-months now) likes to crawl up and down the stairs and “reorganize” the pots & pans cabinet every morning. And all the while, he’s surely safe. But please note: for the comfort of all guests, we require that children be at least 4 or 5 to stay in a shared dorm with other travelers (for those under 4, please inquire of our private room availability). Is Redwood Hostel accessible to disabled travellers? Certainly! The hostel has ramps, first-floor sleeping rooms, and an ADA-approved bathroom and shower with a fold-out bench and adapted shower nozzle. Please let us know when you are coming, and we’ll ensure your needs are met. Sorry, but only service animals are allowed at the hostel. Please call to make arrangements. Expect a little of everything. The wet season runs from November through April, more or less, and it’s cool and sunny the rest of the year. Afternoons get windy, as we’re near the ocean, and summer mornings are foggy. Want to be prepared? Find the weather outlook here. How far are you from the ocean? We’ll keep it in our Lost & Found for one month. Please call and we will send it to you, although we’ll likely ask you to cover shipping costs. After a month, we need to clear out the Lost & Found, and unclaimed items are donated to thrift stores. Is the hostel privately owned? No. HI-Redwood Hostel is one of nine hostels in northern California operated by the Golden Gate Council, which is a non-profit, membership organization affiliated with Hostelling International. 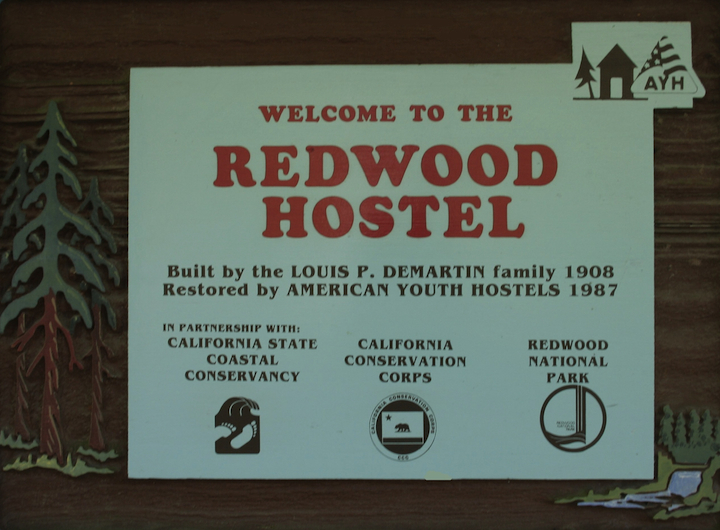 Our mission is “to help all, especially the young, gain a greater understanding of the world and its people through hostelling.” And though Hostelling International runs the hostel, the building and land are part of Redwood National and State Parks. So what is there to do around there? To see pictures of the hostel and nearby area, and to learn more about the hostel and its history, visit our official webpage. We love coffee here at the Redwood Hostel. We love coffee lovers too! As coffee is the 2nd most traded commodity in the world, we want to ensure the folks who pick our coffee beans are properly thanked for their long days among the heat and coffee shrubs. That’s the whole shabang behind Fair Trade. We also want to know our coffee beans aren’t wormed with pesticides. Your liver and my kidney would agree on that one! And then, to make things more complicated in our idealist quest to “do good”, we wanted to keep it local, as much as possible. Well… coffee doesn’t grow here. But coffee roasters do! There’s plenty of good local roasters but we especially like Kinetic Koffee from Arcata. It’s organic, it’s fair trade, and they donate 10% of all proceeds to bicycling and outdoor organizations. Plus, they’ll let us design our own bag for the hostel. Whoo-hoo! So there it is folks. We have a new coffee supplier. You can drink up all of our coffee in the kitchen, anytime day or night, and it’s free. (Though we gently nudge with a Donations Jar and/or Chore Cards). If you like it lots, we sell 12 ounce bags for $8.00 That’s quite a steal for organic, fair trade, locally roasted and deliciously good stuff. Drink on, hostellers. Drink on. Summertime bugs have got me singing! Yes, I spent this past weekend scraping bug bites and intercepting a tick’s giddy crawl towards my son’s ear canal. Aye! Which is why I’d love to share herbal wisdom from Susun Weed. Turns out, the weeds and leaves are all that we need. We are writing to announce this year’s 45th Annual Salmon Festival in Klamath, California. The Salmon Festival is scheduled for August 19, 2007 from 8:00am to 5:00pm with a Veterans’ Breakfast from 8:00 to 10:00 and the parade starting at 10:00 a.m. The Redwood Hostel, along with the Yurok Tribe and other community members will be combining their volunteer efforts to make this day a success. We want to invite all hostellers who are staying with us during this event to participate by simply attending and/or by offering their time and effort as volunteers – the more the merrier and the Yurok Tribe would greatly appreciate any extra hands in this endeavor! These types of venues bring out entire communities young and old and are an excellent opportunity to educate the public on many topics, meet new people and celebrate. If you are interested in joining us as volunteers or simply caravanning over, we will be leaving the Redwood Hostel at 9am on August 19th for the festival. Please feel free to email or call us with interest, questions, etc. or just show up and come along!! 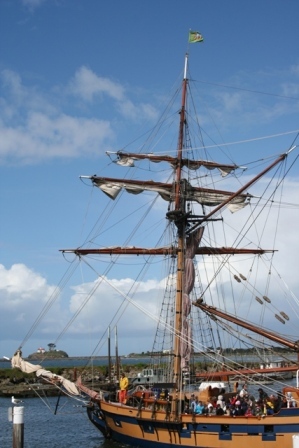 Yes, the ships arrived yesterday and will remain in town through May 6 for Crescent City’s first ever Tall Masted Ships Celebration. The six day celebration features harbor walking tours, a Celtic music concert Friday at 7pm, a car show Saturday, and a harbor fair running both Saturday and Sunday, and numerous musical and theater performances (including The Pirates of Penzance). But the main feature is the two ships, the Lady Washington and the Hawaiian Chieftai, with ship tours, a sunset cruise on Friday, a sunset battle sail on Saturday, and an adventure cruise on Sunday. If you’ve seen “Pirates of the Caribbean: The Curse of the Black Pearl”, you’ve already seen the Lady Washington. But if you want to see the ship in person, get down (or up) to Crescent City harbor this weekend. The Sixth Annual North Coast Redwoods Writers Conference is coming September 15 and 16 to College of the Redwoods in Crescent City, about 15 miles north of the hostel. Considering the hostel here is managed by 2 writers (she a journalist/poet; he a travel writer/novelist), you can bet at least one of us will be present for the conference. And even though they have not included us on their list of lodging/accomodation (I did contact them), we do humbly offer our services to the starving/struggling writer out there seeking an inexpensive bed for the night. (As of this writing, we still have 23 beds available for both Sept 15 and 16.) As an added bonus, if any attendees stay here on Sept. 15th, they can carpool with us to the conference. So you not only save on lodging–you save on gas. Consider the cheery conversation on the way yet another bonus. 1. While the tide is low, walk to Battery Point Lighthouse in Crescent City. It’s the oldest continuously operating lighthouse in the U.S., and a 200-foot sandbar between the mainland and lighthouse makes it inaccessible except at low tide. Supposedly a ghost haunts Battery Point, which turned 150 this year. Open April-September. a) Hostel to Trees of Mystery and beyond (4-7 miles, fairly easy): Climb the steps next to the hostel and hike 2 miles to the Trees of Mystery (see #3). Cross the road and continue .5 miles to Hidden Beach—tucked out of sight from the World—and on your way back, the trail meets up with the Coastal Trail. b) Tall Trees area: Drive 17 miles south to Redwood Information Center, just past Orick, and grab a free permit to Tall Trees Grove (only 50 vehicle permits are issued each day). Hike Tall Trees Trail (1.2 miles, moderate) to see the world’s tallest trees on the alluvial flat formed by Redwood Creek. The trails connects to Emerald Ridge Trail (2.8 miles, moderate), which meets Dolason Prairie Trail (4.75 miles, moderate) and leads to a back country camp in the middle of the wilds. c) Damnation Creek (2.5 miles each way, strenuous): Drive a few miles north on Highway 101 to milepost 16 and park in the turnout, then walk down a steep trail that drops 1000 feet—yes, it’s also a 1000-foot climb back up, but folks say it’s worth every laborious step. Old growth meets the sea, spectacularly. d) Fern Canyon (various trails, easy-to-moderate). This lush, deep canyon near the coast is decorated in seven fern species, lining the walls like a Jurassic landscape. From the hostel, drive south on Highway 101 through Prairie Creek Redwoods State Park, and turn right at Davison Road. Follow the gravel road to Gold Bluffs Beach, and continue another 15 minutes to Fern Canyon. Day-use fee of $6 per vehicle. e) Lady Bird Johnson Grove (1 mile loop, easy): Herein lies the spot where President and Mrs. Johnson dedicated Redwood National Park in 1967. This loop is a nice old-growth walk with detailed ecological information. Drive 15 miles south of the hostel on Highway 101 to Bald Hills Road, turn left and follow the signs. 3. Ride a gondola into the Trees of Mystery (707-482-2251). Excellent for families and anyone else who love the trees, but doesn’t want to work too hard reaching them. It does cost money and the gargantuan statues of Paul Bunyan and Babe the Blue Ox strike some as kitschy, but everyone needs a little kitsch now and then. Don’t miss the Native American museum (free!) and gift shop (also free, unless you buy something). Just 1.5 miles south of the hostel. Look for gargantuan statues on the side of the road. 4. Visit injured seals and sea lions at the Northcoast Marine Mammal Center in Crescent City. Harbor seals, endangered Stellar Sea Lions and other critters live outside in pens and can be visited anytime; read below for gift shop hours and the feeding schedule. The center is a working hospital and not designed as a tourist attraction, so it’s low key, but visitors are welcome. Daily feedings at 8 a.m., noon, 4 p.m. & 8 p.m. Take Highway 101 North, left on Front Street, left into City Park, right onto Howe Drive, which runs parallel to the ocean, and center is at the end. Donations accepted. (707) 465-6265.
wn computer, try the Del Norte County Library off Front Street in Crescent City (Tuesday-Friday 1-6 pm, Sat. 10 am-1 pm) or Tech Town Computers on Highway 101 North / 4th Street in Crescent City, next to Denny’s. 8. Swing. At City Park in Crescent City, you’ll find a public swimming pool and Castle PlayLand for kids and toddlers–with plenty of swings–as well as a fantastic view of the ocean, picnic tables, grass and the Crescent City Cultural Center & Chamber of Commerce. The library is across the street (Tuesday-Friday 1-6 pm, Sat. 10 am-1 pm). From the hostel, take Highway 101 North for 13 miles, turn left at Front Street, and turn left at Play Street. 9. Drive a little…see a lot. We must admit, sometimes it does rain a bit. Okay, it can pour. This is an opportune moment to remind everyone that without 80-plus inches of annual rainfall, those glorious Redwoods filling the memory cards of our digital cameras would turn brittle from thirst, and their shallow roots would weaken into scraggly threads of rope, toppling tree after mighty tree. Just so you know. A) Drive 10 miles south of the hostel to Newton B. Drury Scenic Parkway, which leads into Prairie Creek State Park (thick clusters of Redwoods, herds of Roosevelt Elk, creeks, prairie). B) Drive south over the Klamath River and take the first exit to the Coastal Drive. This meandering crawl is an unpaved marvel. Stop when you spot two farmhouses below. These "houses" were actually a U.S. military outpost built after Pearl Harbor, when Americans feared a Japanese attack by sea. C) Drive 10 miles north to Elk Valley Road, turn right and then turn right onto Howland Hills Road, which is 9 miles long and takes 60 minutes to drive (the closest you’ll get to driving through a tree without paying $5.95). 10. Get in the water! You can swim, surf, kayak or canoe the rivers, oceans & lagoons. Our most recommended kayak outfitter to the south is Kayak Zak’s (for lagoon kayak rentals or guided sea kayaking) at 707-498-1130 … and to the north is Lunker Fish Trips (for kayaking the Smith River) at 707-458-4704. Both outfitters are seasonal, usually from Memorial Day thru Labor Day. Our fave surfing outfitter is Noll Surfboards in Crescent City, at 707-465-4400. If you want to get crazy and charter a boat into the ocean for deep-sea fishing, try Tally Ho II at 707-464-1236. 3 Extras: If the above don’t keep you busy all day, try a jet boat tour up the Klamath River from May thru September (Klamath River Jet Boat Tours at 707-482-7775), tour the Redwoods in the Fun Bus (707-482-0227) or watch the sea lions and schooners at Crescent City Harbor.